I’d earlier written about sending HTML emails from PeopleCode here and more recently here. In both these posts, the email text was hardcoded thereby making it not possible for the business folks to edit. In this post, however, I will show you how to use the Notification classes along with Generic Templates to send out an HTML email. By using Generic Templates, you can empower your business users to edit the wording of these emails without having to deal with the IT staff. Generic Templates also offers multi-language support. Let’s start by setting up a Generic Template. 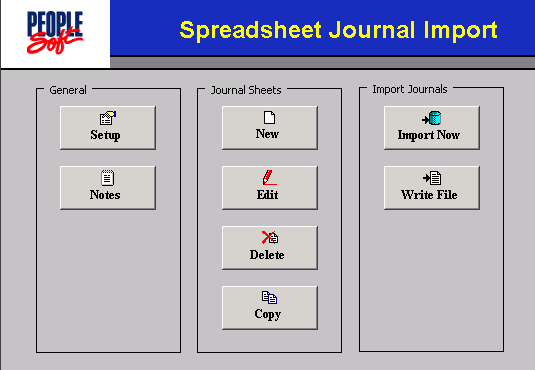 As shown in the image, this is a simple page to use. You can use an online wysiwyg editor to generate the html if you are working on complex formatting. If multi-language emails are required, you need to fill this page by selecting the desired language from the language selector. You can add as many bind variables as you need and use them within the message text. You will have to use an array to pass the values of these bind variables as you will see in the code below. You can use the PT_WF_NOTIFICATION package in this scenario. This package too uses the MCFOutboundEmail class as seen in the previous post to send out emails. 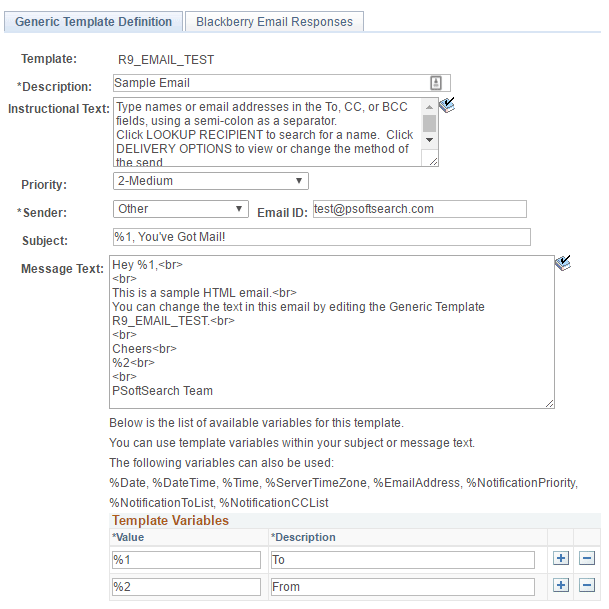 However, unlike the MCFOutboundEmail, here we can use NotificationTemplate class to specify a Generic Template. 1. I was not able to get the NotifyFrom to work correctly because of what seems to be a bug in the Notification class where it uses the email from PSUSEREMAIL if &NotifyFrom is NOT EMPTY (really?) and EmailReplyTo is empty. So, if you set the EmailReplyTo property, the class uses that email id as the sender else it uses the user’s email id from PSUSEREMAIL as the sender. I’m on PT 8.54.08. 2. If you want a dynamic table or something similar, you can generate it as shown here and append it to the Message property. This is the email that the code sends out. Using Generic template is a helpful way to give your user the ability to customise email text. PT_WF_NOTIFICATION is the app package that contains all the classes you need to do this. This method also provides muti-language support. As Generic templates are not managed objects, you will need to write Data Mover Scripts to copy these across to other instances. Have you used generic templates to send emails? Were business users happy about the fact that they could customise the email text? Can you please help with it ? Thanks for the article. We are trying to send a High Priority and Confidential email via templates. The mailbox used is Microsoft Outlook. Is there anyway to do this? Have a look at the MCFOutboundEmail Class Properties. The Priority property and the Sensitivity property are the ones you are after. I’ve covered MCFOutboundEmail class here. Do you have code to send an attachment along with this generic template? You can use the FileNames and FileTitles properties for sending attachments – both accept arrays. FileNames will have the absolute path of the file(s) to be attached. FileTitles will have the name(s) with which these attachment(s) would be shown in the email. Please add the following code before &oNotif.Send(). Is there a way to embed an image in the mail body through this notification classes. @Siva, the easiest way is to use an img tag within the HTML to display a publicly accessible image. @Sai, You may want to have a look at this post which explains MCF classes to do this.